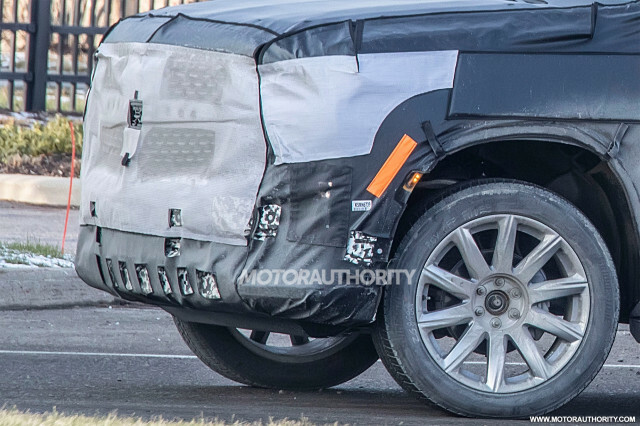 Behold the first spy shots of Cadillac’s next-generation Escalade. The new flagship SUV is due out next year as a 2020 model and will bring with it major weight savings, a significant uptick in style, and loads of new technology to combat Lincoln’s impressive Navigator. In fact, the Lincoln rival can be seen in some of the shots, confirming it’s being used as a benchmark for the new Escalade. General Motors is in the process of redesigning its full-size fleet around the T1XX body-on-frame platform for SUVs and pickups. The platform is an evolution of the current K2XX design and swaps out some steel for aluminum to shed the pounds. We hear it might help the new Escalade shed close to 300 pounds compared to the current model. 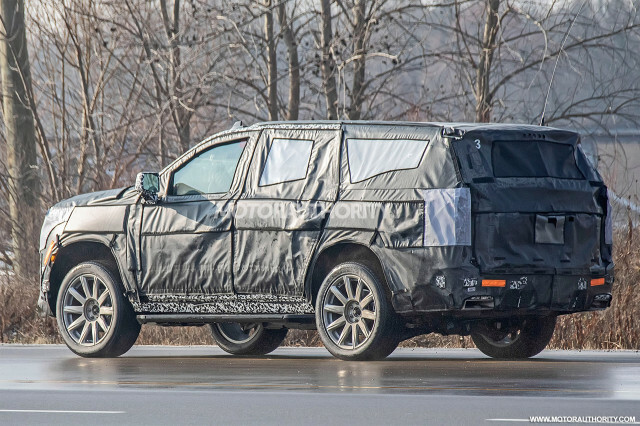 The platform also brings the option of independent rear suspension, which the spy shots confirm will feature in the redesigned Escalade. This should significantly improve ride comfort and handling over the solid rear previously fitted to the luxury SUV. The 2019 Chevrolet Silverado 1500 and GMC Sierra 1500 pickup trucks are the first vehicles to ride on the T1XX. GM has since unveiled a 2020 Silverado 2500 Heavy Duty on the platform, and redesigned Chevy Suburban and GMC Yukon SUVs based on the platform are just around the corner. The redesigned Escalade should bow in the first half of 2019 before starting sales in the fall. The fifth-generation Escalade is one of five new or redesigned models Cadillac will introduce through the 2020 calendar year. The first was the XT4 compact crossover and at next month’s 2019 North American International Auto Show in Detroit we’ll see the covers come off a new XT6 mid-size crossover. Also in the pipeline are CT4 and CT5 sedans. As with the upcoming XT6 crossover, the redesigned Escalade will get a frontal lighting design that isn’t as relentlessly vertical as the current model. We can see that the primary headlights sit at the top of the front fascia and reach toward the center, while a daytime running light with Cadillac’s signature vertical motif remains. The taillights still run vertically up the rear fenders, although camouflage disguises how far they will run up the rear pillar. It appears the Art and Science design language isn’t fully dead just yet but expect the latest Cadillacs, including the redesigned Escalade, to adopt the more evolved look first shown on 2016’s Escala concept car. The Escala’s mesh pattern for the grille can also be seen poking through some of the camouflage gear. The nose of the vehicle also looks to be bulkier and sit higher than on the current model, which should give it a dominating stance. Adding to the impressive stance are 22-inch wheels which on the testers are wrapped in 275/50-size Bridgestone tires. 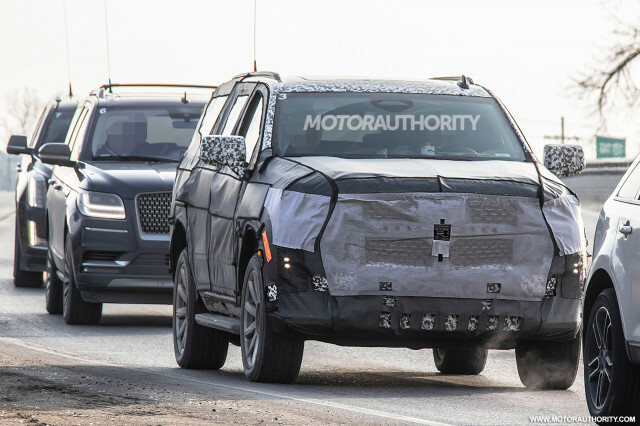 A side mirror design unique to the Escalade prototypes seems to be in play, encompassing additional sensors, likely for Cadillac’s SuperCruise partial self-driving feature that will certainly make its way into the new SUV. It isn’t clear what Caddy has in store for the powertrains but the brand-exclusive 4.2-liter twin-turbocharged V-8 should feature in a model delivering 500 horsepower or more. A naturally aspirated 6.2-liter V-8 should also be offered, and possibly a plug-in hybrid option at some point. A 10-speed automatic will be standard and buyers will be able to chose between rear- and four-wheel drive. It’s too early to talk pricing but a starting figure approaching $80,000 is likely. A pricier ESV long-wheelbase model is also planned and could see the Escalade enter six-figure territory. 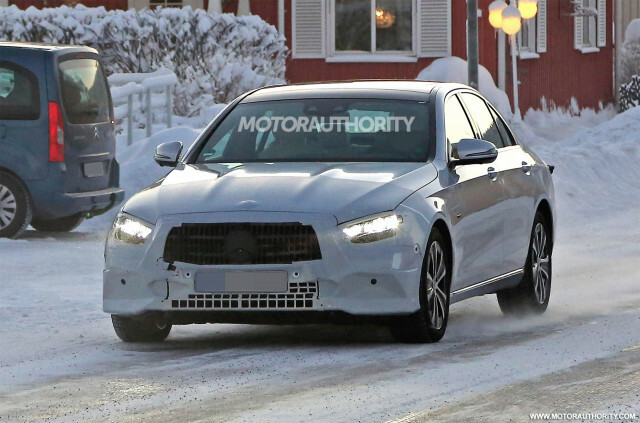 Mercedes-Benz’s E-Class family is approaching the midway point in its life cycle and a prototype for an updated member has just been spotted. 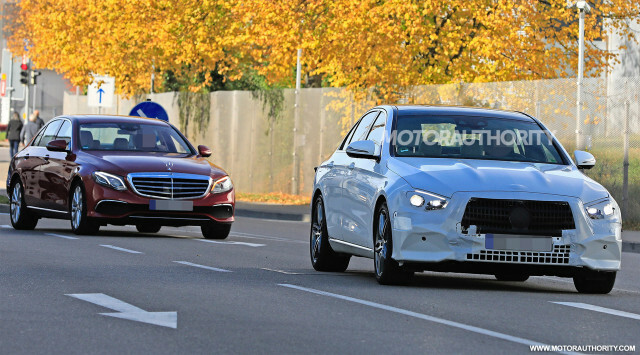 The prototype is for the E-Class sedan but similar updates should be bound for other E-Class members. We’ve also spied prototypes for the updated E-Class Coupe and E-Class Wagon, as well as the E-Class All-Terrain soft-roader sold overseas. The current E-Class family was introduced for the 2017 model year, arriving initially in sedan guise. In Mercedes tradition, we should see the updated models introduced for 2021. The cars will be given a substantial makeover, with the headlights taking on a design similar to the units found on the latest GLE SUV. This should provide further differentiation between the E-Class family and smaller C-Class, which the current E-Class closely resembles. A shot including the current E-Class provides a good contrast. There also appears to be a new grille hidden beneath some of the camouflage gear. The taillights will also be renewed, and you can count on the designers changing the front and rear fascias too. It isn’t clear what the designers have in store for the cabin but it’s possible we see Mercedes’ latest infotainment system added (shown below). The system features a large touchscreen that can be operated much like a smartphone or tablet. The infotainment system also includes natural speak voice activation. In the powertrain department, we could see the E450 trim swap from a V-6 to Mercedes’ new inline-6 and mild-hybrid setup. A high-performance version of this powertrain already features in the E53 from Mercedes-AMG that was added for 2019. A plug-in hybrid option should also join the range. An E63 from AMG will continue to be the range-topper, with its powertrain to remain a twin-turbocharged V-8. Peak output could be lifted beyond the current model’s 603 horsepower in E63 S trim, though. Look for the updated E-Class family to debut in late 2019 or early the following year. As mentioned above, the cars should be introduced for the 2021 model year. 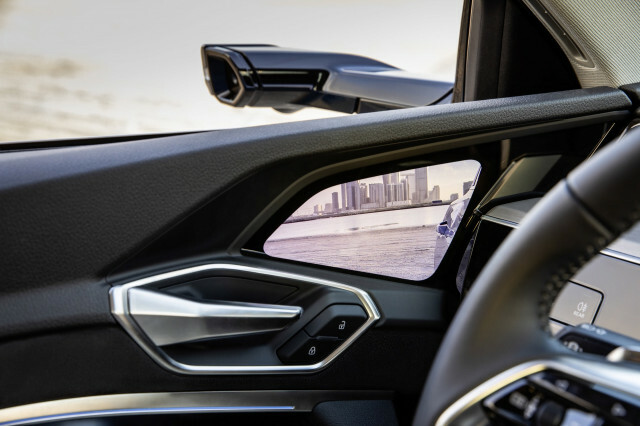 2019 Audi e-tron has cameras instead of mirrors*, but do they really work? 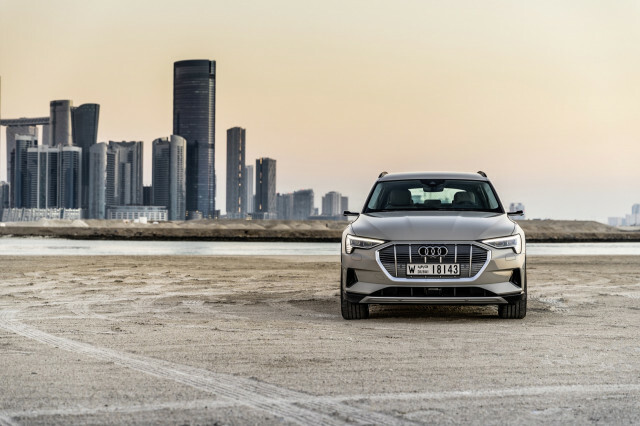 The 2019 Audi e-tron will skip out on one piece of technology when it arrives in the United States, hence our asterisk in the title. U.S.-spec e-trons will not receive the futuristic camera-as-mirror technology. Thank outdated regulations for that. 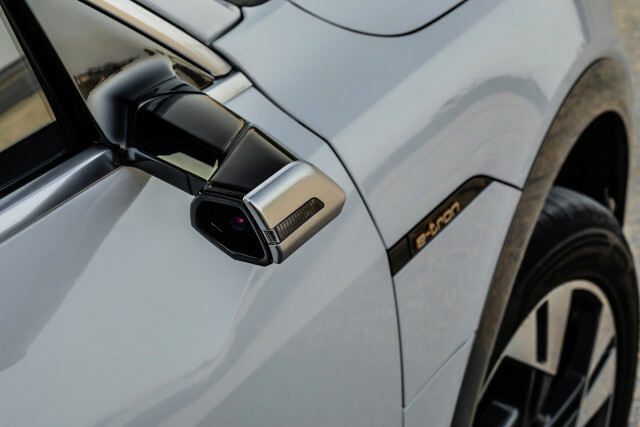 Instead, we’ll receive standard side mirrors, while Audi outfits international models with a side-camera system, something Lexus offers on its ES in some markets. Green Car Reports took a deep dive into the system in a Thursday report, and it was an eye-opening experience to say the least. Mounted on the upper door sills are two 7-inch, 1280×1080 OLED screens, where one might expect a stereo speaker to reside. These screens provide the feed from a corresponding rear-facing camera sitting where we expect side mirrors to be. Audi said the camera system helps improve the e-tron electric crossover’s coefficient of drag from 0.28 in U.S. versions to 0.27 for a Euro-spec version. That small difference can add 3 miles of electric range at highway speeds. While the technology brings novel promises with it and true engineering benefits, when pushed to the test in everyday driving scenarios, it seems they fell short. Sunlight often washed the screens out during the day, and during nighttime driving the display registered blotchy halos from the headlights of cars following behind. Furthermore, the surrounding world becomes more granular as the sun set further and darkness washed over the day. The brightness levels also seemed to play havoc with drivers’ eyes. During the day, the screen was dimmer than one would prefer when flicking their eyes between the windshield and checking for traffic. But, at night, the screen was far brighter than needed. The camera system also means a driver will spend a good amount of time staring at five screens—two OLED screens for the cameras, a digital gauge cluster, and an upper and lower screen for the infotainment and climate control systems. And depth-perception? Very poor with the cameras, unlike a good ol’ fashioned mirror, which the human eye adapts to much easier. At the end of the day, it appears Americans won’t miss out on the technology. The e-tron is currently available to order and is priced from $75,795. Deliveries commence in the second quarter of 2019. Posted bydave December 14, 2018 Posted inHighlightLeave a comment on 2019 Audi e-tron has cameras instead of mirrors*, but do they really work?